Who Should Lead the Digital Transformation of Healthcare? Today’s Healthcare sector is living a full transformation all around the world – even though the growth in Europe is being slow compared to the US. “Changing the old rules of the ‘game’ in a blink of an eye constitutes a rather complicated goal. 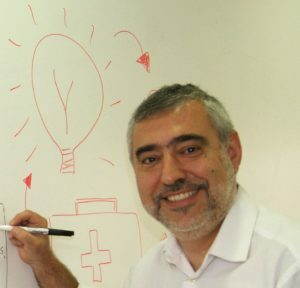 Digital Health is a revolutionary transition that will take time before it is adopted on a regular basis”, Roberto Ascione explains in his article – you can find it in this newsletter. The European Commission is working on this Healthcare transformation. Sylvain Giraud, “Performance of national health systems” Head of Unit in the EU, also shares with us his reflections. “Smart investments are needed to transform health systems in Europe for the better”. Infrastructure, tech and services: the investment triangle. But, who’s going to lead the way? Health organizations, public administrations, private companies, professionals, patients – we all form a huge ecosystem. Starting point: we cannot ‘grow’ without each other. The answer: Let’s work together because we all have something to say about the digital transformation of healthcare. It’s time to all start pulling in the same direction – and we also want to do our bit. eHealth Hub opens a new window focused on the business of eHealth. Technologies allows the paradigm shift, but turning them into businesses is still the key to success. eHealth Hub offers free business support for eHealth SMEs, healthcare providers and ecosystem stakeholders in Europe. No matter the stage of your company – we have a service for you. If you’re an entrepreneur, we help you define your business model. If you’re already in the market, we offer specific support to accelerate your commercialization. If you’re a big corporation looking for digital health solutions, we match your needs with solutions on the market. If you’re looking for private finance, we facilitate access to funding rounds – also helping you answer the big question: where is the money? If you have legal, regulatory and reimbursement questions, we are building a European network of experts at your disposal. To sum up: if your business is in digital health, contact eHealth Hub. We’ll find the best way to help you become big and successful. Jorge González is coach of the SME Instrument of the European Commission and SME Horizon of the Ministry of Economy.